In 2014 Christian Woman magazine spent a year focused on the topic of prayer. 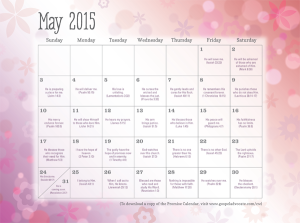 Featured in every issue was a prayer calendar with scriptures guiding our thoughts. Last year’s prayer calendar, written by Michelle Moore, was so well-received by our readers that Michelle has prepared a new calendar for 2015. The theme of this year’s calendar is “God’s Promises.” With each issue the two-page color insert will appear on pages 27 and 28, suitable for framing or posting on your refrigerator or near your work station, or you can download the calendar for May and June here. The January/February calendar can be found here. The March/April calendar can be found here.